6) What’s Behind Climate Change Activist Greta Thunberg’s Remarkable Rise To Fame? 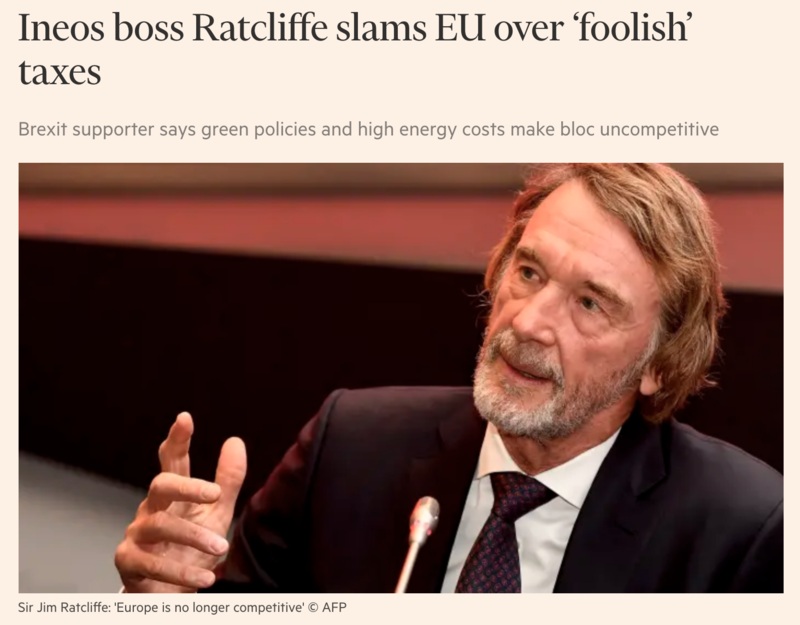 The chemicals tycoon and Brexit supporter Jim Ratcliffe has fired a broadside against the EU, accusing it of “foolish” green taxes that deter investment and describing the continent as “no longer competitive”. The billionaire businessman, who runs the $60bn chemicals and energy group Ineos, slammed EU environmental policies as counterproductive and said they had driven industry away. In a withering open letter to the European Commission president Jean-Claude Juncker, Sir Jim also took aim at the bloc’s labour laws and high energy costs. Industries that are large energy consumers and polluters, such as chemicals, steel and ceramics, have long complained that EU measures such as the carbon emissions trading scheme put them at a disadvantage to rivals in regions with less stringent regulations. 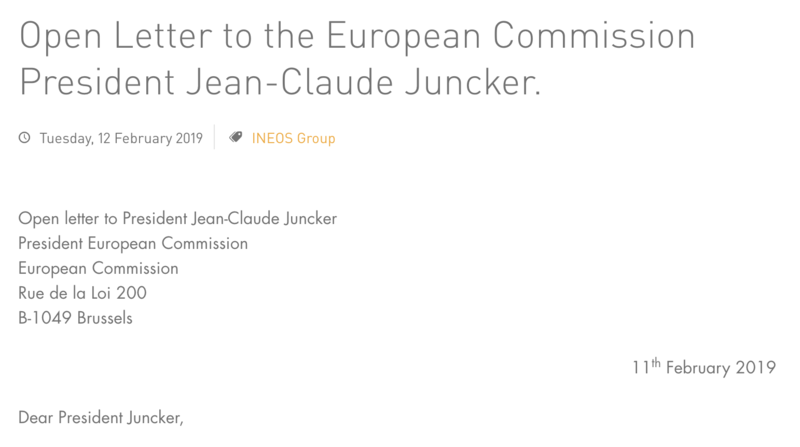 The missive comes after Ineos chose Belgium as the location for a new €3bn petrochemicals investment billed as the largest in Europe’s chemicals sector for a generation. However, Sir Jim said that “nobody [else] in my business seriously invests in Europe”, resulting in an ageing chemicals industry with old environmental standards. This was in contrast to the US, he added, which is spending $200bn on more than 300 new chemical plants and had “welcomed new investment on the condition that it has the highest possible environmental standards”. “Europe going it alone with green taxes prevents renewal as it frightens away investment into the open arms of the USA and China. It also pushes manufacturing to other parts of the world that care less for the environment,” Sir Jim wrote, noting that Europe’s share of the $4tn global chemicals market had halved in the past decade to 15 per cent. Founded two decades ago, Ineos has grown to become a major supplier of basic chemical building blocks that go into a range of everyday products. The privately owned conglomerate has also expanded into the oil and gas sector and plans to start manufacturing an off-road vehicle inspired by a classic Land Rover model. The intervention on public policy is the latest by Sir Jim, who this month attacked the UK government’s rules on fracking as having “no basis in science”. **and send a copy of his warning to your MP, Senator or Member of Congress. Last week offered fresh evidence that the most consequential historical shift of the last 100 years continues: the decline of Europe as a force in world affairs. 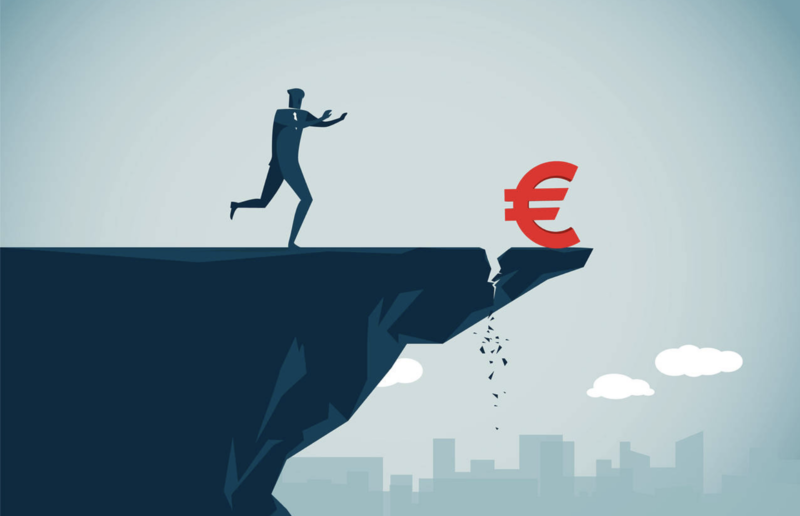 As Deutsche Bank warned of a German recession, the European Commission cut the 2019 eurozone growth forecast from an already anemic 1.9% to 1.3%. Economic output in the eurozone was lower in 2017 than it was in 2009; over that same period, gross domestic product grew 139% in China, 96% in India, and 34% in the U.S., according to the World Bank. As its economy lags behind, Europe is becoming more divided politically. Brexit negotiations have inflamed tempers on both sides of the English Channel; Central European countries like Hungary and Poland are alienated from the West; much of Southern Europe remains bitter about the aftermath of the euro crisis; and anti-EU political parties continue to gain support across the bloc. A recent report from the European Council on Foreign Relations projects that anti-EU parties from the right and left are on course to control enough seats in the next European Parliament that they will be able to disrupt the EU and weaken it further. This wasn’t supposed to happen. The EU was founded to stop Europe’s decline, not reflect it. As Europe’s founders saw it, two factors contributed to the Continent’s geopolitical decline in the 20th century. One was inevitable: As the technologies of the industrial heartland spread to Asia and the Americas, the wealth gap between Europe and the rest of the world necessarily narrowed. The diffusion of medical innovations — which also often originated in Europe — contributed to population explosions in the rest of the world. Meanwhile Europe, the first continent to industrialize, was the first to experience the decline in birthrates associated with urbanization and affluence. The second factor in Europe’s decline was internal division and nationalistic animosity. This was the problem the EU’s founders sought to cure. Two world wars left much of Europe impoverished and in ruins. If the Continent could unify under a single set of values and political institutions, future wars could be averted. The unification process began with Franco-German reconciliation after World War II. As the Cold War ended and Germany was reunified, European leaders launched an ambitious program to broaden and deepen transnational cooperation. The union would expand to the east, securing democracy in the former Warsaw Pact countries. Economic cooperation would deepen with the development of a single market, the establishment of a common currency, and the adoption of common economic policies. Diplomatically, the Europeans would seek a united front in their dealings with the outside world. Building a new Europe that could compete on equal terms with the U.S. and China in the post-Cold War world is Europe’s overarching goal. It’s become increasingly apparent that this grand project is failing. An uneven and perhaps overambitious expansion weakened rather than strengthened the EU. The euro was both an economic and political failure, and diplomatic unity remains a distant dream. Neighbors like Russia, Turkey, Israel and the Arab states flout the EU’s wishes at will. European influence in Washington, already declining in the Obama years, has reached a nadir under Donald Trump. Neither Moscow nor Washington showed much regard for Europe’s interests while suspending the Intermediate-range Nuclear Forces Treaty, which limits missile deployments in Europe. China takes Japan and India more seriously than it takes the EU, and neither the U.S. nor China has been particularly concerned about what Europeans think as they negotiate bilateral trade arrangements that may redefine the world trade system. One European initiative did work: the single market. Europe remains formidable as a consumer bloc, and the EU’s ability to regulate the conditions under which foreign companies like Google and Gazprom operate inside its wealthy market is the most important card in its hand. Leaders in France and Germany remain firmly committed to the European project, but with Britain on the brink of secession, Italy and Poland mutinous and Hungary defiant, the outlook is dimming. If Paris and Berlin could devise a program to reignite European growth, secure its frontiers, and satisfy the nationalist emotions now roiling the bloc, Europe could arrest its decline. So far at least, such an outcome seems unlikely. Some on the nationalist right in the U.S. welcome Europe’s decline. This is a mistake. A strong Europe, even if it is sometimes cantankerous and disagreeable, is better for the U.S. than a weak Europe that can neither secure its own neighborhood nor contribute to global stability. But the U.S. must deal with the Europe we have, and the Europe we have isn’t doing well. 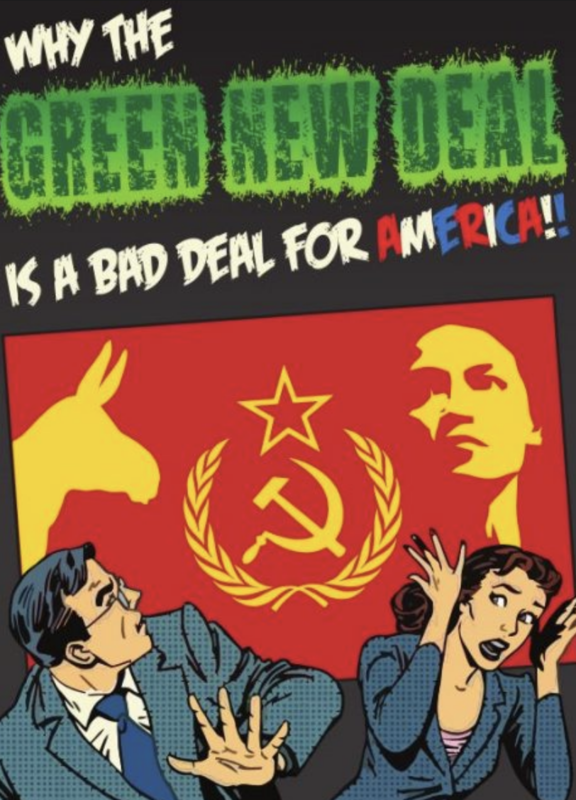 The Green New Deal uses environmentalism as a lever to pursue a far-larger, more sinister, agenda, a mad leap to a socialist nightworld. Alexandria Ocasio-Cortez is out to prove she is the Thomas Jefferson of the infantile social-justice progressive Left. And she is doing one (non-carbon emitting) hell of a job. She is a marvel. In her mere 35 days as a freshperson in Congress she’s made her mark. She’s the Cardi B (I like to fake hipitude) of the Democratic party (the very seal of death to the Hillary era – it’s done); she takes to Twitter like a (Donald) duck to water, provokes whole rivers of drool over at CNN and MSNBC, and is the very embodiment and avatar of every social-justice warrior and barista malcontent’s idea of the perfect politician. Ocasio-Cortez, like the Bishop of Ussher before her, knows when the world will end: 2030. She has said so — “We only have 12 years left.” And on that rock she has built her church. Her policies are determined from her predetermined date of apocalypse in 2030, unless … unless we heed her urgent call. Ms. O-C, as I shall sometimes for brevity refer to her, is thereby much to be prized. She is the most perfect example ever offered to the public at large of a Greener who says what is on the Green mind, who doesn’t water down the message to avoid scaring off people whose feet occasionally make contact with the ground, one who puts in writing for all to read what it really means if you believe all the stuff about skinny polar bears and deliquescent ice caps, shrinking lobsters and sinking cities, the whole dreary catalogue of infinite earthly degradation about to fall on us all, if “climate change” as the cause of wars, warts, pestilence and famine and whatever else can be put on a bullet-list, is not stopped in its tracks — now! She out-Suzuki’s Suzuki. She out Naomi’s Klein. If Al Gore had wed Jane Goodall, and Elizabeth May presided at the ceremony, eventually the world would have cheered the nativity of someone very likely to grow up as Alexandria Ocasio-Cortez, the Captain Marvel of the Green movement. I suspect her poster adorns Catherine McKenna’s office wall. Justin Trudeau himself, were he not now preoccupied with a recalcitrant minister and fiddling with disaster on the persnickety principle of the rule of law — and how it intersects with one’s popularity in Quebec — would probably do a bhangra in her honour. So Green she is, he would ask her for a selfie. Last week, Ms. O-C issued one of the greatest fantasy projections since H.P. Lovecraft was possessed by the anima of Lewis Carroll. Read it and weep America. “IPCC Report said global emissions must be cut by 40-60% by 2030. U.S. is 20% of total emissions. We must get to 0 by 2030 and lead the world in a global Green New Deal. — Take the airplanes out of the sky — monorails will replace air travel. Bye-bye Amazon, bye-bye FedEx, bye-bye Boeing, bye-bye American Airlines, all domestic aircraft. — Eliminate the internal combustion engine, stripping the nation of all cars, boats, bulldozers, cranes and tractors. Bye-bye General Motors, bye-bye Ford, bye-bye automobile workers, bye-bye unions. — Go to fossil fuel zero before the end times. This amounts to shutting down or off the greatest industrial economy the world has ever seen — in 10 years no less. — Free health care for all. Housing for all. Free everything for all. Contrary to some overwrought responses, it does NOT call for the public strangulation of the rich and the disembowelment of billionaires, however diverting that spectacle would be. Only because there will be no need. In unmitigable despair, they will seek traditional exits from this vale of tears via skyscraper window ledges (the stockbroker leap) and braided hemp neckties (the oak branch-high-above-the ground-in-the-backyard farewell) all on their own. The world is literally a greener place than it was twenty years ago, and data from NASA satellites has revealed a counterintuitive source for much of this new foliage. A new study shows that China and India—the world’s most populous countries—are leading the increase in greening on land. The effect comes mostly from ambitious tree-planting programs in China and intensive agriculture in both countries. Ranga Myneni of Boston University and colleagues first detected the greening phenomenon in satellite data from the mid-1990s, but they did not know whether human activity was a chief cause. They then set out to track the total amount of Earth’s land area covered by vegetation and how it changed over time. The research team found that global green leaf area has increased by 5 percent since the early 2000s, an area equivalent to all of the Amazon rainforests. At least 25 percent of that gain came in China. Overall, one-third of Earth’s vegetated lands are greening, while 5 percent are growing browner. The study was published on February 11, 2019, in the journal Nature Sustainability. 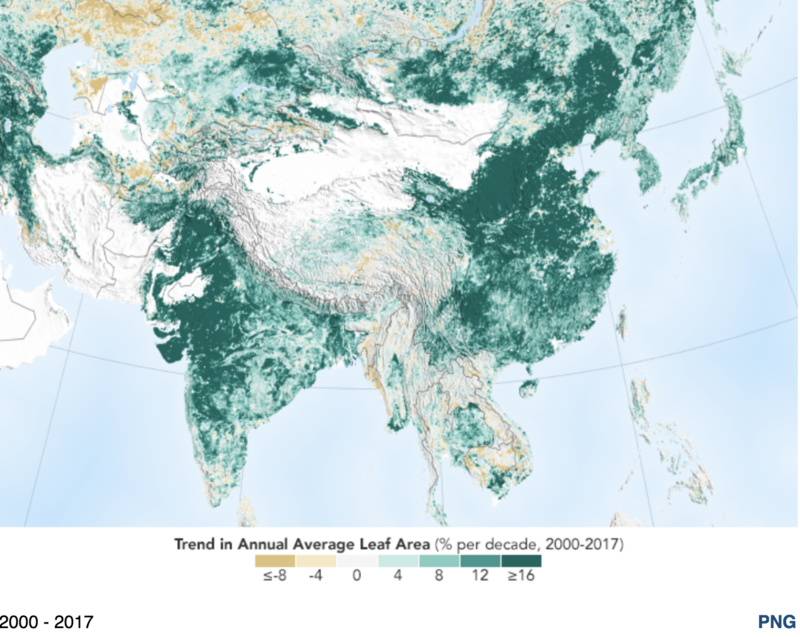 The maps on this page show the increase or decrease in green vegetation—measured in average leaf area per year—in different regions of the world between 2000 and 2017. Note that the maps are not measuring the overall greenness, which explains why the Amazon and eastern North America do not stand out, among other forested areas. This study was made possible thanks to a two-decade-long data record from the Moderate Resolution Imaging Spectroradiometer (MODIS) instruments on NASA’s Terra and Aqua satellites. An advantage of MODIS is the intensive coverage they provide in space and time: the sensors have captured up to four shots of nearly every place on Earth, every day, for the past 20 years. China’s outsized contribution to the global greening trend comes in large part from its programs to conserve and expand forests (about 42 percent of the greening contribution). These programs were developed in an effort to reduce the effects of soil erosion, air pollution, and climate change.